SHELFSTORE are the specialists in home office shelving, bookcases, living room shelving, and kids’ room shelving. However large, small, narrow or deep the area that you need to fill is, we will be able to help you to construct the ideal space saving solution. 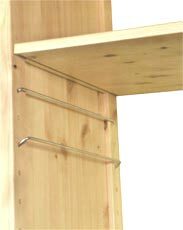 SHELFSTORE, quite simply are the specialists in shelving systems and bookcases and other space saving home furniture solutions. Once you know the dimensions of the area which you wish to convert to storage, we can help you design the ideal shelving solution for you.